“Ama ganłaak!” The students echo “good morning” back to their teachers. The kindergarten class sits on a rainbow-coloured mat, some of them bounce in excitement. Today at Lax Kxeen Elementary School the students will meet a real life baby and learn about growing up using Sm’algyax words and Tsimshian culture. In front of them, a mother holds her newborn son. Their Sm’algyax teacher, Kelli Clifton, directs the class and works with elder and fluent speaker, Alex Campbell. “P’as ada Suwilaayks,” Mr. Campbell said in Sm’algyax, introducing the subject of the day “Grow and Learn”. The students carefully repeat after him. Mr. Clifton asks what colour the baby’s eyes are. They respond in both English and Sm’algyax, with some help. They learn his age, how much he weighs and what the baby’s crest is: Gistbutwada di pdeext, killer whale, the same as his mother, who happens to be a Sm’algyax teacher on maternity leave. Both Indigenous and non-Indigenous students in Ms. Clifton and Mr. Campbell’s class raise their hands, or even call out to prove they know the answer in Sm’algyax before others. Ms. Clifton gently reminds them to use the Sm’algyax word if they use the English word instead, and they quickly repeat her. In 2015, all schools in School District 52 required students from kindergarten to Grade 4 to learn Sm’algyax . The district is on traditional Tsimshian territory where the first language is Sm’algyax . But colonialism, old laws and the residential school system sought to dismantle the language in an attempt to assimilate Indigenous peoples. Aboriginal students make up 62 per cent of the student population in the district, and yet many of their parents and grandparents don’t speak the language of the land because of the residential school system legacy. In 1997, before the Truth and Reconciliation Report was released in 2015, a language committee made of fluent speakers, leaders, elders, matriarchs and parents rallied to have the language brought into the school system, even if just for 10 minutes. “That is where it originated from, just the hard work of all our leaders who blazed the trail before us and made it happen. Now, 20 years later we have a Sm’algyax program as an approved second language for Grades 5-12,” said Roberta Edzerza, district principal of Aboriginal education. The fourth principle in Truth and Reconciliation Report called for constructive action to address the legacies of destructive impacts on Aboriginal peoples’ education, cultures and languages. Construction action began in Prince Rupert 12 years ago with a pilot program to teach Sm’algyax to students in kindergarten to Grade 4 in two of the elementary schools. The program involved having a Sm’algyax teacher go into the classroom and teach using songs, play-based learning and fun activities with everybody learning together, Edzerza said. Then three years ago, with extra funding and resources, the language was brought to all the other schools and 45 minutes of the traditional language was included in weekly regular courses. Grade 5-12 students can choose whether they take Sm’algyax or French as part of their second language requirement. “Our classes are full,” Edzerza said, adding that more than 1,000 students across the district take lessons in the language. The young students buzz with energy, but when Mr. Campbell speaks they turn their heads in attention to hear what the 82-year-old has to say. Perhaps that is because the first thing the students learn is łoomsk or “respect”. “Everybody knows that word, łoomsk, that’s respect. The number one word that we preach on and teach on day after day. Know what that is and then we start talking about our identification, our identity,” Mr. Campbell said. He was a part of the Tsimshian language committee that brought Sm’algyax to the school district and structured the course, which is a work in progress. The oral language is thousands of years old, but the written language is still young. On a weekly basis, a small group of five to six retired Sm’algyax teachers and fluent speakers meet at Wap Sigatgyet, the Aboriginal education office for the school district, and revisit how the words should be spelled and how the language is being taught. Mr. Campbell is a living resource for his students. He doesn’t only make sure their pronunciations are correct, he shares stories of the past and the traditions passed on. “To me, the language is very important because if we don’t have the language then we don’t have history at all,” he said. The names of the mountains, rivers, trees in the area all have an adawx or “oral history” or “truth telling”. From Lax Kw’alaams, Mr. Campbell grew up at Inverness Cannery, until he became a logger and a fisherman. Teaching came later. The hereditary chief primarily works out of the Charles Hays Secondary School but he also travels to Lax Kxeen Elementary. In other elementary schools, a fluent language teacher assists the classroom teacher during the lessons. After the kindergarten students in Ms. Clifton’s class learn about the two-month-old baby, they’re told that he will return with his mom in a few months’ time to discover how he’s grown. It’s difficult to tell, but Ms. Clifton is only in her first year of teaching the language. Her father spoke Sm’algyax and she knew a few words. In school she took French immersion, expanding her capacity to learn other languages. And as an artist, she uses her creativity to explore the words that stem from the North Coast. For the past two years, she has also been attending night classes to improve her grasp of Sm’algyax . 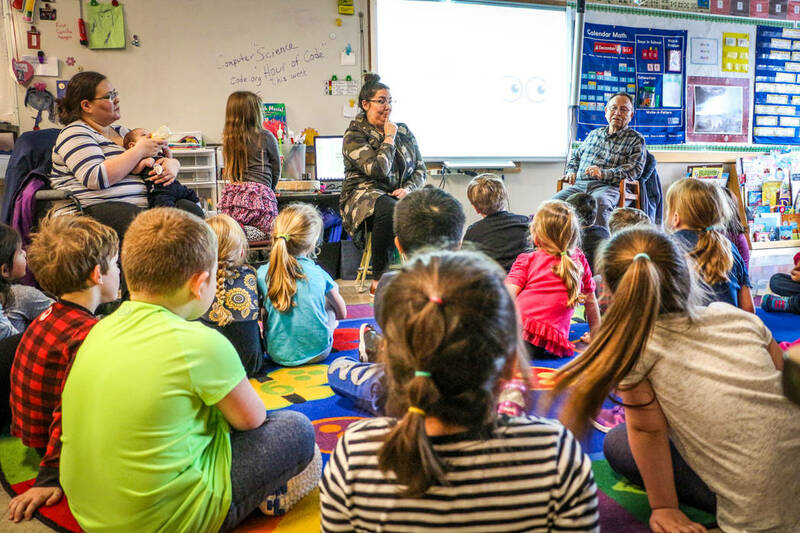 “This is my first year working as a teacher in the elementary schools and that has been an incredible experience,” she said. She enjoys when students greet her in Sm’algyax when they pass her in the halls. From five-year-old students to young teachers and professionals, a new generation is picking up the language before it disappears. There are only approximately 75 people who speak the Tsimshian language, according to the 2016 census by Statistics Canada. Although Sm’algyax has been taught in the district, at least in some classrooms, for the past 20 years, reversing the damage of the past will take time. “Our language is starting to disappear, not very many people can really come out and teach the language or use the language for some reason,” Mr. Campbell said. But a language that could have waned over time is now being taught to hundreds of students each year in the school district. Principal Edzerza’s sons have studied their language at school. Her eldest son took Sm’algyax from kindergarten all the way to Grade 12, and although she said he’s not fluent he has gained so much more. “I find that learning the language of the territory, little bits and pieces of it, kids are not going to become fluent having it from K-12, with my son having it from K-12 he is far from fluent, but what he gained in that was pride, identity, culture, respect, probably a sense of warmth and welcoming in that classroom while he’s learning it with his peers. There’s a lot to gain I think for everybody,” she said. In Part 2 next week watch and read what elementary and high school students have to say about learning Sm’algyax.